HOT DEALS: Save 20% on all REL subwoofers in the Unilet Sinful Saturday sale | What Hi-Fi? This Saturday, May 19th, Unilet Sound and Vision is offering 20% off all REL subwoofers for one day only. The entire REL range will be available during the Sinful Saturday sale: from the T5 at £340, reduced from £435, to the range-topping Studio III down from £6000 to £4799. The one-day sale starts at 9am and ends at 6pm. Meanwhile, the Blue Murder Sale (see below) continues until June 9th. 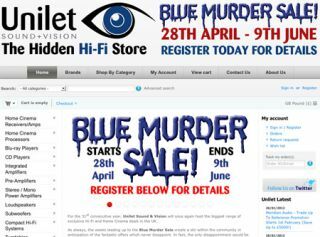 Mark the date in your diary: the legendary Unilet Sound & Vision Blue Murder sale starts on April 28th and will run to June 9th at the firm's New Malden premises. In support of the Olympics and Diamond Jubilee, the 2012 sale will sport a British theme, supporting the best in British hi-fi and home cinema kit. • Arcam AVR400 home cinema receiver (silver) £1099 (was £1099). So whether you're after a new micro hi-fi system, speakers, headphones, multichannel amp, media streamer or flatscreen TV, make sure you register on the Unilet website to get a sneak preview of the best bargains. General manager Vernon Hamblin says: "It's time to clear the credit cards, cancel the holiday, make a space on the rack and grab yourself a bargain." Unilet is based at 35 High Street, New Malden, KT3 4BY.